New York Rep. Michael Grimm surrendered to the FBI Monday morning and was arrested on federal charges, including tax fraud and mail fraud, for allegedly concealing more than $1 million in sales and wages at a Manhattan restaurant he owned before he was elected to Congress. Grimm was charged Monday in a 20-count indictment that accuses him of under-reporting the payroll and earnings of the Upper East Side restaurant, Healthalicious, which he ran from 2007 to 2010. He pleaded not guilty in federal court and was released on bond. 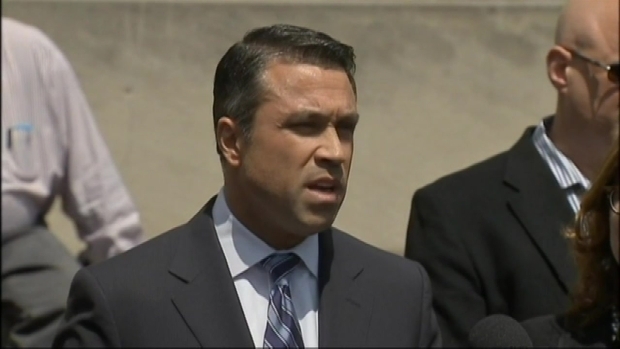 "Michael Grimm never met a tax he didn't lie to evade," U.S. Attorney Loretta Lynch said. Grimm, a Republican, said he was being wrongly accused and said he had no plans to step down. "I'm a moral man, a man of integrity, and I also know I have more service and leadership to provide this country," he said. Nevertheless, Grimm asked House Speaker John Boehner to be taken off the House Financial Services Committee until his federal case was resolved. 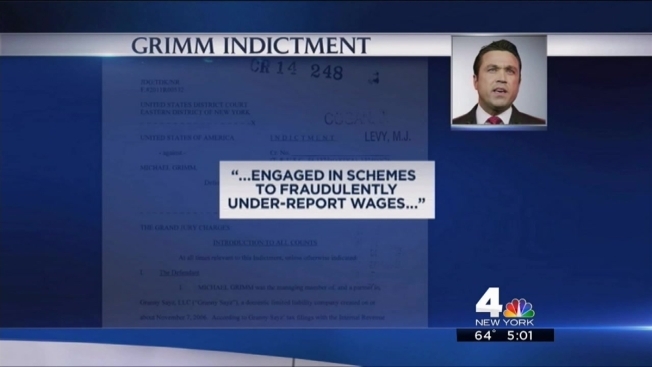 Prosecutors say Grimm employed a number of immigrant workers who did not have legal status to work in the U.S., and paid them in cash -- wages that were not reported to the government. He also allegedly "substantially under-reported" the restaurant's gross receipts, lowering its taxes. Grimm sold his stake in the restaurant before running for office in 2010. The former FBI agent and U.S. Marine is serving his second term representing Staten Island, and is running for re-election this year. Grimm's lawyer, William McGinley, suggested last week the charges were "politically driven." New York Rep. Michael Grimm says he is staying in Congress after his arrest for allegedly concealing more than $1 million in sales and wages at a Manhattan restaurant he owned before he was elected. One of Grimm's fundraisers was arrested earlier this year by the FBI and is accused of using straw donors to funnel more than $10,000 into his campaign. Grimm has not been accused of any wrongdoing in that case, which is still under investigation. In January, Grimm erupted at a local TV reporter on camera and threatened that he would "break you in half, like a boy" after the State of the Union address when he was asked about the federal investigation into his campaign finances. New York Rep. Michael Grimm did not speak to reporters as he left court following his arrest on federal criminal charges, including tax fraud and mail fraud, for allegedly concealing more than $1 million in sales and wages at a Manhattan restaurant he owned before he was elected to Congress.